Fernando Perdomo relocated to L.A. from Miami; bringing along a chest of stories, covetous yearning, flashbacks, love stories and emotions- Warm is a cornucopia of wealth from a tender and zealous heart. With the album picking up an impassioned momentum, I investigate its most striking and touching track. "Fernando Jose Perdomo (born August 17, 1980) is an American singer-songwriter, musician, multi-instrumentalist, record producer . Originally from Miami Beach, Florida . He has toured, performed and recorded with various artists in many different genre's. He is the co-producer of "The Soul Of All Natural Things", the new album from the legendary Linda Perhacs. In 2010 Fernando Perdomo and his band Dreaming in Stereo were signed to a management deal with Bill Aocoin, under his company Aucoin Globe Entertainment. However, Aucoin became ill and died due to surgical complications from prostate cancer. Aucoin has also been credited with discovering, developing and managing the legendary rock band Kissand Billy Idol. Dreaming in Stereo 2 followed in 2010 to glowing reviews. The band showcased at SXSW 2010 and also backed up the legendary Andy Pratt. In 2012 Perdomo released his debut Solo EP, "Home is Wherever You Are" produced by Grammy nominated producer, Chris Rodriguez. Perdomo moved to Los Angeles in 2012 and opened "Reseda Ranch Studios" in Reseda. His first project is co producing (with Chris Price) the long-awaited second album by Linda Perhacs. He is also currently producing The Defiant, Jim CamachoLittle Dove, Robert Avellanet, Rooney Anne James, Graham Marshall, Trudy Miquelerena, Apryl Electra, Rebecca Schwab, Nicole Marcus, Melissa Thatcher, Andy Pratt, Melissa Thatcher and Records and Tapes. In 2013, Perdomo formed Records and Tapes with Jennifer Jo Oberle. The band has released 2 singles and a music video. His new single, "Photographers in Love" came out on 11/08/13." In addition to recording, Perdomo runs Reseda Ranch Studios in Los Angeles, and is amongst the busiest, most talented and ambitious musicians around. His mature, assured and tantalising musicianship and songwriting will reap rewards- and ensure that these sensibilities bring in a varied and impassioned fan base. Perdomo's wide range of sounds and styles means that his music does not subjugate and discriminate. If you are a fan of '60s and '70s classic U.S. Folk acts then you will find much to appreciate. Similarly, there are Beatle-esque touches (within the L.P.) that will please aficionados of classic British 1960s music. Openness and honest mingle with introspection and personal tragedy; swelling and touching made-for-movies scenery rubs shoulders with sun-drenched multifairiousness and light. Kaleidoscopic and dream-like visions run rampant, and each track is gorgeously crafted and considered. Not confined to a season or narrow sense of occasion, the songs can be appreciated in any weather, and at any time. Nothing is transient or sluggish; songs make their impressions known and linger long in the mind. If you appreciate music which offers its heart on its sleeve; that which implores you to look within yourself; to be uplifted and invigorated- then Fernando Perdomo fits the bill exquisitely. The opening notes of California Moon tenderly set the scene. Twisting and springing guitar notes evoke a myriad of scenes. Instantly, your mind is transported to some post-dusk Los Angeles highway; nothing but contemplation and open road lays ahead. Undertones of (Bryter Layter-era) Nick Drake and Ray LaMontagne come through, yet it is a sonic sojourner that soon gives way to our frontman's entrance. Talking of "dancing in the dark", Perdomo's voice has a husky and calming air; earnestly speaking to his sweetheart, he implores her to join him- to go dancing under the heady glow of the moonlight. It is hard not to be put in mind of the Folk legends of the '60s and '70s- there is that same sense of authority and quality that comes through. The guitar is subtle but evocative; saying so much with few notes, Perdomo deftly puts the listener in his thought. It is nigh-on impossible not to imagine and speculate as to what the song's author sees- the sights, smells and sensations are all there. The chorus marries Drake-esque vocal touches with an impassioned and direct coda: "California moon/Shining on you". 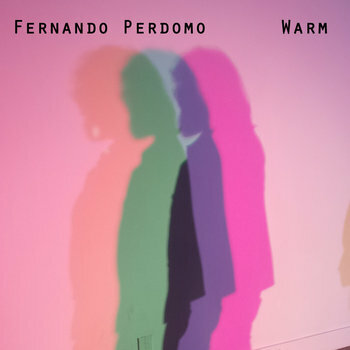 Whereas a lot of contemporaries infuse some negativity and cynicism into their love songs, here the mood is ripe, receptive and honest- Perdomo and his love are entwined in the night's air, nary a trouble to be found. By the time the chorus is repeated and weaved, it solidly sticks in your head; its infectious and simple charm is hard to ignore. The melody and vocal projection put me somewhat in mind of Prefab Sprout (particularly their albums Crimson/Red and Let's Change the World with Music); you can hear that same charm and urbane reflection within. Similarly, one could imagine Paul McCartney penning a similar track in 1967/8- if you listen to The Beatles, you could envisage California Moon slotting right in the mix. Comparisons aside, Perdomo has a real flair for song craft; able to mix contemporary Folk and troubadour sensitivity with latter-day Pop glory. By the final third, guitar notes mutate and evolve; from acoustic arpeggio flow through to electric wail, the atmosphere is kept alive, vibrant and filled with life. As the closing stage arrive, our frontman once more expounds the wonders of the night and ensures that the insatiable and indelible melody remains in your thoughts (for a long, long time). California Moon is a track that wins you over with its simple beauty and conviction, providing a much-needed breath of fresh air- away from the negativity and bait-and-switch that a lot of modern-day music promotes. THEN your search should start (and end) here.